I think it’s really fitting that as I am sitting here reading The Suitcase Entrepreneur by the lovely Natalie Sisson, I’m sitting on a plane heading to Dubai where I will be reunited with my dear sister and starting an international family adventure that also includes Italy and Bali. My own little Eat, Pray, Love. One of the best parts? I am sitting here at 40,000 ft. with my laptop, working. My biz is going with me as I travel! For me, it couldn’t have worked out better. I am an avid traveller. From the time I first started working as a teenager, I squirreled away every penny so that I could go on trips. Granted, when I first started my business, the travelling slowed down somewhat, keeping me mostly here in Canada on adventures in the Prairies, or Toronto and Montreal. Or a little further afield with my regular trips to spirituality workshops in Florida. But I was bootstrapping myself and didn’t really have international travel as a top priority. So this is going to be the first, “true trip” by my definition, working while on the road and exploring the world. And I couldn’t be more stoked! Which is why I wanted to read Natalie’s book. 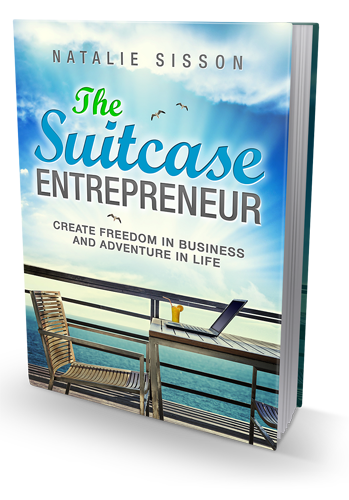 I became my own Suitcase Entrepreneur by accident. But this is a really common desire and I was interested to hear Natalie’s take on things and read her advice for how to go about this purposefully. Business Bravery: Ditching the cushy job and all its trappings. All of us entrepreneurs need to take deep risks. Natalie did. You did. Any small business owner has. It’s inspiring to hear about the journey of others and to know that we’ve all gone through through tough times to make our businesses happen. She includes not just her own stories but those of others in many VERY different personal situations and fields. Living YOUR Life: That it’s not much about living out of a suitcase literally, unless that’s what you want, but living life on your own terms – despite what our cultures and societies try to jam into our heads. We DESERVE this, each and every one of us. So if you want to work from the beach or work from your backyard, what’s holding you back? YOU are! You have to change how you think and what you’ve deemed possible. Internet Awesomeness: The internet has changed the way we do business. I have seen this first hand in my small business alone. You can either deny this and just keep on doing things the way you always do, or embrace it and see if you can find a way to do things better (for you, your business, your bottom line). Natalie shares a TON of tools and resources with actionable advice. I definitely learned about some new ones that I will be looking into. Passion: Success revolves around your passion for what you’re doing. Do you love it, or do you just want to make money? Think about that and the difference in feeling between these two approaches to working. So many people work jobs they hate for the money. If you fall into the same trap with running a business, your well being and happiness are at stake. Use Natalie’s advice and you’ll be working smarter and more efficiently. From tools to outsourcing to mind set, to focusing your marketing efforts. And fun travel related stuff too, such as packing light and tips for being organized, as well as travel hacking to save you money (so you can travel more!) and things that you need to know when traveling with your biz (such as secure internet connections). All in all, it’s a great guide to get those inspirational juices flowing and to help motivate you to realize that this isn’t a pipe dream; heck, Natalie lives it day in and day out. If you’ve been looking at your biz model and dreaming of a shift into online, I think this book will be really helpful for you! If you do the Amazon thing you can buy it here through my link (learn more about my affiliate philosophy here), or on Natalie’s site for a few other options. Have you dreamed of running a location independent business? Or a business that doesn’t need you to be around so darn much? What has been standing in your way? Meet you in the comments! Enjoy your travelling adventure, Martina! Happy for you. Thanks girl! It’s been a blast so far! Next time come visit me in Switzerland!! Sarah recently posted..How Do I Delete My Unsubscribes from Aweber? Previous post: Images on your blog more important than ever!